Band of Brothers: Texas Arrows is the third game in the Band of Brothers series of WW2 tactical games. It follows the US 36th Infantry Division through Italy, France, and Germany during WW2. First line and elite US Infantry squads are introduced. In twelve scenarios, they face a mixture of opposition forces including second line Germans, first line Germans, and Panzergrenadiers. New vehicles make an appearance as well. Texas Arrows uses the same streamlined proficiency system introduced inBand of Brothers: Ghost Panzer. Ownership of both Screaming Eagles andGhost Panzer is required to play. The initial print run will also include 2 sheets of counters that will update Screaming Eagles counters to the updated proficiency system introduced in Ghost Panzer. 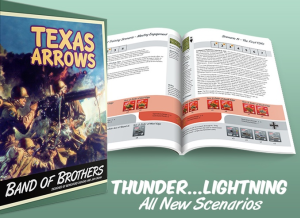 Texas Arrows is NOT a standalone game but needs Screaming Eagles and/or Ghost Panzer to play. TEXAS ARROWS will include 12 new scenarios (6 requiring SE and 6 requiring GP). They are the most diverse and interesting scenarios in the Band of Brothers system. You’ll get a full counter sheet with the 36th Infantry division units, as well as 2 new mounted boards with updated game art, .All new player aid cards, and a larger game box to store all of your BAND OF BROTHERS goodies. It also includes an upgrade kit for owners of original SCREAMING EAGLESthat has 2 card stock game boards with original art plus 2 full counter sheets of Screaming Eagle Counters with the new proficiency system.It will also include the new series rules. Some of the new counters include the German Hetzer (Troublemaker), Nashorn (Rhino), SPW 251/10, and Pillbox/Fortified counters. TWO double sided, FULL COLOR player aid cards. These player aid cards are newly laid out and formatted with pictures and a clearer presentation of the modifiers used in the game. This is a dependent expansion for the Band of Brothers series. It contains a double sided 22"x34" map. Map 27 is of a large hill formation and Map 28 is a winter map with woods and a village.